Haltech ECU Output - Idle Speed Motor UNIVERSAL - MiataRoadster - Stay tuned with MiataRoadster! 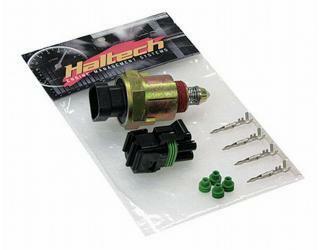 The Haltech Idle Speed Motor is a 4 wire stepper motor controlled idle valve, this valve allows the ECU to control the volume of air entering the intake manifold at idle. Once the ECU has control of the volume of air entering the intake manifold it can control idle speed regardless of engine temperature, engine load (from an automatic gearbox or AC compressor) or additional electrical load (from AC controls or headlights). The Haltech Idle Speed Motor has been designed specifically for use with the Haltech idle speed control housing (although it can also be used directly with some GM throttle bodies). The Haltech idle speed control housing is machined from block aluminum to exacting tolerances required for a perfect seal every time. The housing is then anodized black for that stealth look inside your engine bay. The Haltech Idle Speed Motor connects via a weatherproof 4 wire connector.